Join our Flower Box Club & receive regular seasonal blooms. Join our Flower Box Club and receive a regular box of beautiful flowers handpicked from our cutting gardens here in Scotland, for you to arrange at home. Each box will contain a collection of blooms and foliage carefully chosen for you to create one bouquet or divide into smaller arrangements. This is your chance to be creative! Flowers are seasonal, changing weekly and monthly, so you can enjoy a range of flowers in tune with nature. For those that need a little help to arrange the flowers we will supply simple suggestions as well as a list of ingredients and a focus on a special bloom of the month/week. Local collection from Glasgow or Stewarton is £36 large, £25 medium and £15 small. Boxes are available on a weekly, fortnightly or monthly basis. For national delivery by Royal Mail we are offering the medium size for £38 or large for £49 including postage and packaging. 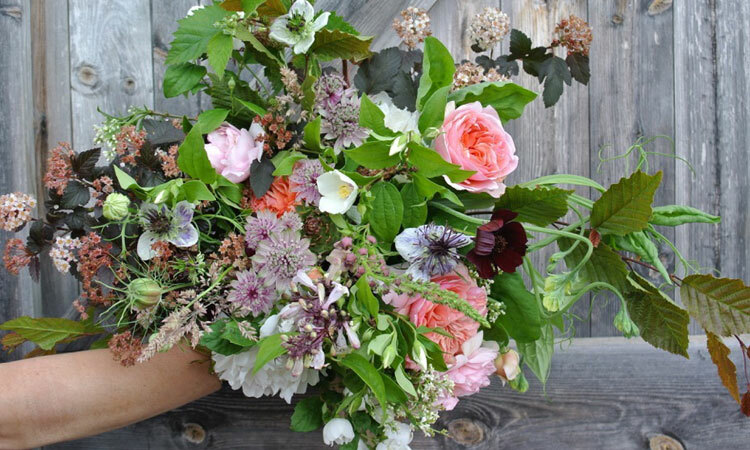 We’d love to see your fantastic creations – email us pictures of your bouquets and we’ll add it to our blog. And share your good work with us on Facebook and Twitter for your friends to see. Join by completing the contact form and we will be in touch to confirm delivery address and frequency, alternatively phone to discuss options.